Jinxed Thoughts: Thoughts on Star Trek Discovery S2E4 "An Obol For Charon"
Thoughts on Star Trek Discovery S2E4 "An Obol For Charon"
I actually really liked this episode. This was probably my favorite so far, counting both season 1 and 2. The reason I like it so much is probably because they finally gave me three things I have been asking for many times - a backstory for someone else than Michael, a slowing down of pace in the story telling and editing that doesn't make me want to throw something at the screen. I'm going to adress the last of those three points first because even though I might complain a lot about it, it's probably the least important one. In this episode, scenes were allowed to just themselves without all the make up, and it just proved to me how much more I prefer it. Scenes were shot straight on, without all of the cutting, jumping and spinning around we've seen in the first three episodes of this season and it is so much more enjoyable to watch. It's difficult to say who has the worse day on the job in this episode, Saru or Tilly. In the end it is probably Tilly, but before we get there let's set the stage. Discovery sets off after Spock and for once that is all the setup this episode needs. Another thing I am thankful for, as I've also felt that some episodes are trying to cram a bit much into the runtime. This episode turns out to be a big long excuse to build up Saru's character (with just a little bit added extra) and this feels like Star Trek to me. Actually, let me mention something that isn't big in the episode but big to me and big to Star Trek in general I feel, that happens just a bit before the episode sort of sets off. We briefly get to meet Pike's "Nr 1", or second in command. She is played by none other than Rebecca Romijn (the woman who plays Mystique in some of the X-Men movies), but I didn't recognize her! I only noticed it when looking up the credits. But anyway. Why does this matter? I've mentioned before that Cpt Pike stems from the original pilot episode of TOS. When they scrapped that pilot and re-shot a new one with Shatner, they changed almost everything. 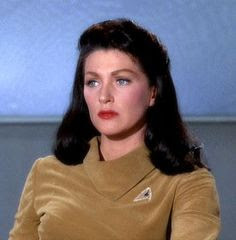 One thing they changed was Pike's second in command, a woman played by one of the biggest names in Star Trek, Majel Barrett (if you want to know why she matters, google!). One of the changes they made was to make Spock second in command instead and turn Majel Barrett into Nurse Chapel, because having a woman as second in command was apparently too outlandish for this space faring adventure. The irony is not lost on me nor many other people, so it was so great to see this character again. Majel didn't seem too salty about the whole thing in the end and I would like to think she'd be happy to see this revival of her character. I hope this character will feature a lot more. 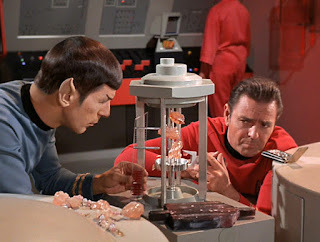 Chasing after Spock, the Discovery is suddenly stopped by a mysterious, and as it turns out very old, sphere that's just hanging around in space. What does it want? First thing it does is infect the Discovery computer with a computer virus, making the universal translators malfunction in a pretty hilarious scene where everyone is suddenly speaking a different language. Saru, who is sick as established in an earlier scene, is brought in because of his vast language skills. It doesn't take him long to fix the translator, but it turns out the computer systems are much more infected than that, and soon barely anything works on the ship. It also turns out Saru seems to be getting sicker along with the ship. Meanwhile down in engineering, Tilly and Stamets have caught the blob thing. They get a visit from Engineer Jett when the computer systems start to malfunction. Jett and Stamets have a pretty funny scene trash talking each other and each respective propulsion system, ending with a nice environmental message a la Star Trek. At this point we have still to find a reason why the spore drive doesn't figure in any other, later, Star Trek series, but every ship is still being run on dilithium, but this episode will actually make a start at explaining that soon enough. I quite like the Jett character, she has a lot of personality and that is very much in line with other engineers in the Star Trek series. A sudden surge of something or other allows the blob thing to re-attach itself to Tilly again. Saru notices that something is not right with him beyond a regular cold and as his health deteriorates, he explains to Burnham that he seems to have entered the dying phase of his species (could this also be interpreted as a parody on men who say they're dying when they have a cold?). This triggers a set of scenes where we get a lot more background information on Saru, his species and the culture of his home planet. These scenes are allowed to take their time, which I am so grateful for. This is exactly the slowing in pace I asked for in my previous post. Here, they're not afraid to give the character the time and space it needs, without something blowing up around it. Thank you, more of this please. Michael is of course not too keen on Saru dying, but Saru assures her there is nothing she can do to change it. Burnham runs to engineering to see if she can help out. She finds Stamets and Jett trying to figure out what to do with Tilly and her blob thing, and gives Stamets the idea to try to communicate with it. Burnham then also gets the idea that the sphere is maybe trying to communicate with them through the computer virus. She goes back to Saru while Stamets and Jett set up to trepanate Tilly. If you haven't come across trepanation before, consider yourself lucky. It basically means making a hole into someone's skull, and in Tilly's case it is going to happen with a regular damn drill because that is what they have on hand. The reason for this is to install the cortical implant they need to be able to communicate with the blob that has re-infested Tilly's body. While the trepanation scene is probably as gentle as such a scene can possibly be, it still pretty much gave me a headache just from watching it. 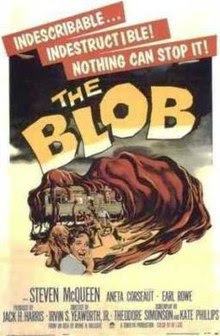 Talking to the blob they find out that it is angry. Angry with Stamets for invading its home, the spores. Stamets asks for forgiveness and says he is going to try to make things right. This short exchange gives us a big clue as to why the spore drive is eventually taken offline and never mentioned again. The blob-thing isn't happy with Stamets reassurances though, and starts to cover all of Tilly's body (poor woman). They manage to cut her out of there, but the blob thing responds by drugging them and kidnapping Tilly back again to... well it's entirely unclear where Tilly ends up but I guess we'll find out in the next episode. In another part of the ship Burnham explains her idea that the sphere is trying to communicate to Saru who immediately catches on. At first I found it a bit odd that Saru wouldn't think of this first, but I explain it by the fact that he is actually dying. They try to convince Pike, who is increasingly losing his patience, not to fire on the sphere but rather let it share its knowledge with them. Eventually he accepts, the sphere explodes (but saves the ship) and the Discovery has 100.000 worth of space travel information to sift through. Saru and Burnham go to say goodbye to each other and Saru asks Burnham to do the act of cutting his ganglia before his illness will make him go mad. Just as Burnham is about to do it however, the ganglia just fall off and Saru is still alive. Never felt better in fact. He tells them he now doesn't feel constantly fearful, and instead quite powerful. But he also questions what consequences this has on his species and homeworld, as it turns out their traditions and reasons for dying have been lies all along. It's actually quite powerful stuff, and it really makes me want to see what happens if Saru goes back to his homeworld to change things. Pretty much swapped for Seven of Nine. The whole thing with Saru also really reminds me of Kes from ST VOY. Kes is an Ocampa, and when she is taken to Voyager she is assumed to be of a fairly weak species. They only live 9 years on average and because their planet was barely habitable they hadn't accomplished much. It turns out though that the Ocampans possess some of the strongest mental abilities of any species in the galaxy and Kes can towards the end alter physical matter at will. I wonder if Saru will have a similar development and I'll be honest, I'd love for that to happen. If it turns out the Kelpiens, if left unkilled, turn out to be some sort of super-species and that is the reason they have been culled. You read it here first folks. So overall a really good episode. While the whole sphere thing was, as mentioned, just an excuse to build on Saru's character (although it is possible this will have further repercussions along the way) I really couldn't care less. I want more episodes like these please, and I really hope they continue down both these story-paths. While the Tilly one seems like it'll obviously continue, now they've opened up a whole can of Saru and it was great.